Scan lines and VHS winding noises greet you when you boot up Morph Girl. Inspired by Japanese horror and games like Firewatch, Morph Girl is a very interesting indie FMV game. As FMV, or full-motion video, has come back into vogue with games like Contradiction: Spot the Liar, Obduction, and the re-release of Night Trap, Morph Girl sits in a unique position. A $4 game on both Steam and Itch.io, it plays more like a vignette or student project than a larger game, having more in common with a Twine project than AAA releases. The protagonist of Morph Girl, Elana, is one of only two actors in the game. Most of the story plays out from Elana’s perspective, as she goes through her daily routine. As it goes on, you learn Elana’s backstory: The long, drawn-out loss of her wife Rebecca left her in shambles, and so she lives vicariously through mementos of her lost love. Watching Rebecca’s favorite movies, reading her short stories, flipping through scrapbooks—almost a year on, Elana is still trying to keep the memory of Rebecca alive, still mired in grief. There aren’t any puzzles or other genre standards to speak of. Most of Morph Girl plays out in video, occasionally interjecting to allow the viewer a choice or two to make. When I asked developer Jordan Doyle over email why they made Morph Girl as a game rather than a short film, they remarked that it had actually started out as the latter. What manifests from that grief is the enigmatic monster, a creature resembling the girl from The Ring. As Elana’s grief continues to consume her leading up to the anniversary of Rebecca’s passing, the creature makes its presence known, and Elana has to figure out what to do with her newfound housemate. The low-fidelity presentation, from VHS noises and scan lines to the aspect ratio, all stir up memories of old horror tapes. VHS, especially, is a common theme in classic Japanese horror. Though Morph Girl doesn’t elicit too many real scares, the tension it builds with its aesthetic is palpable. The constraints were originally due to a lack of sufficient equipment (the game was filmed on an iPhone 6S), but Doyle tells me the limitations seemed to work in the game’s favor. Shadows are darker, the visual and aural noise add tension, and the handheld shots add a sense of presence for the audience, like you’re a bystander to the actions. 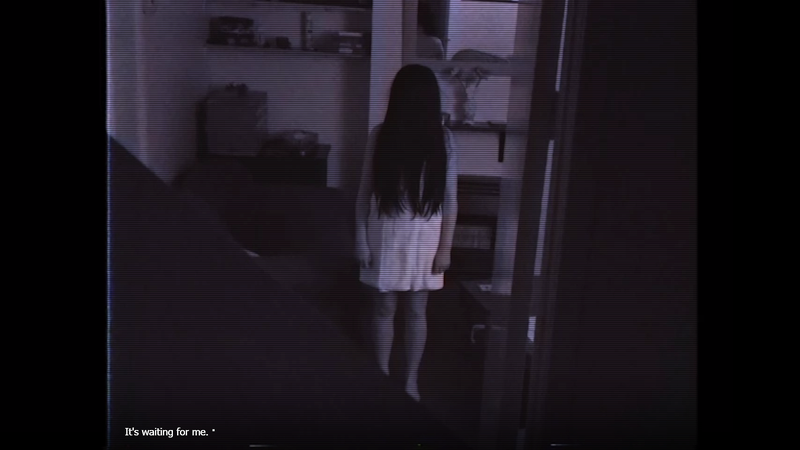 “Given that Japanese horror movies actually sparked a massive movement of low budget, digitally shot, straight-to-video film releases in Japan, a smartphone certainly felt like an appropriate parallel to that,” said Doyle. While coping with the monster in Elana’s house, the game takes you back through Elana and Rebecca’s relationship leading up to her death. In a segment Doyle tells me was inspired by Firewatch, you make Elana’s choices throughout Rebecca’s diagnosis and treatment. Should you stay in the city or move somewhere cheaper, to afford better treatment? Do you read a draft of her novel, or do you put it off? It all leads up to six different endings, and while I’ve only seen a handful of those, they range from unique to heartbreaking. Morph Girl is a little rough around the edges, a few typos here or an odd technical hiccup there. It’s not the most professionally produced FMV title, but those imperfections end up used to its advantage, as Doyle adapts the format to make something unique. I don’t know if I felt significant closure once I wrapped up my time with Morph Girl, but I came away appreciative of the effort and earnestness of what it was doing. In a digital age, most developers have the tools available to make an FMV game, and Morph Girl is proof you don’t need high-end equipment to make something worth playing. Hopefully, this short-and-sweet vignette is the first of more independent FMV games to come.